Temple Beth El was constructed in 1883 and is the oldest synagogue building west of the Mississippi that is still in use, and the 14th oldest in the country. The first documented Jewish settler in Jefferson City was Morris Obermeyer, who started a mercantile business in 1844 along with his brothers Louis, Simon and Joseph. The Obermeyers were well respected members of the community and their business prospered. Morris passed away in 1876 and his body was taken to St. Louis for a proper burial. A short time later nine Jewish men formed the Jefferson City Hebrew Cemetery Association. The site of the first Jewish Cemetery, Maple Grove, was located in the 1300 block of East McCarty Street in 1879. At that time they also organized a congregation, naming it “Congregation Beth El”, which means House of God, to promote the reform Jewish faith. In 1882 Congregation Beth El used $1800 raised by the Hebrew Ladies Sewing Society to a purchase a lot, located at 318 Monroe Street and build the synagogue. Prominent local architect, Frank B. Miller designed the Temple Beth El building. Miller later became one of the most well respected area architects designing other noteworthy buildings including the Cole County Court House, Central Trust and the original Library. The plaque was placed in the sanctuary by the founding members thanking the Ladies of the Hebrew Sewing Society for their untiring efforts to raise the funds for the Temple. The women are listed with their first and last names which was quite unusual for the time. The plaque remains on display in the sanctuary to this day. In the 1930s the old cemetery needed to be moved due to road construction, thus a new location for Jewish burials was necessary. The Congregation entered into an agreement with Riverview Cemetery, and after gaining proper permission, 29 graves were moved to the new location. According to a letter from Jerome Cohen, the active families in the early 1930s included the Meyerhardts, Baers, Hermans, Cohens, Feinsteins, and Wassermans. 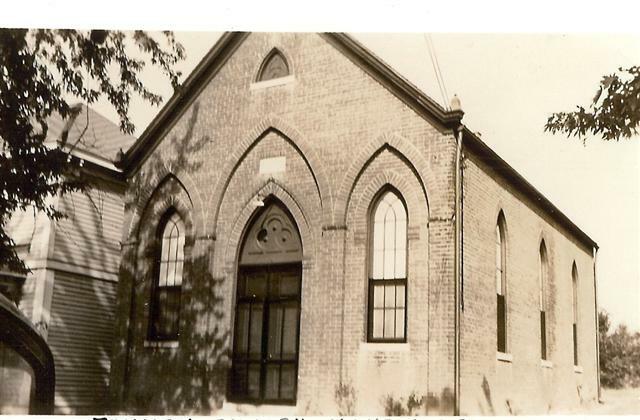 In 1934 the congregation was able to raise enough funds to hire a Rabbi. Rabbi Carl Schorr was hired and for about a year he presided over services. In 1937 Rabbi Schorr left the community, and the congregation has relied on lay leaders and visiting Rabbis ever since. Members and their children over the age of 13 take turns leading Shabbat services each Friday night. 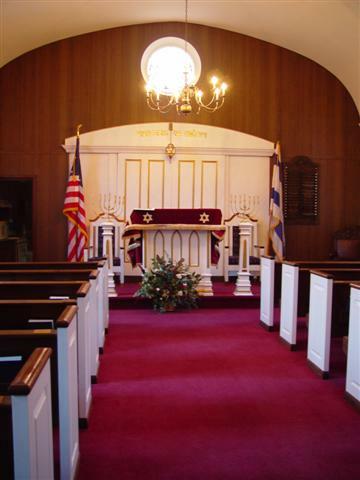 On September 19, 1954, a statewide ceremony was held at Temple Beth El to mark the tercentenary of the first Jewish settlement in the United States. Governor Phil Donnelly signed a proclamation recognizing the event and a number of visiting Rabbis presided over services that day, including Rabbi Isserman from St. Louis. In preparation for the big event, the sanctuary was updated, and an addition was built on the back of the sanctury with a kitchen, social area and bathroom. Prior to this addition, the building was heated with a stove, and those who needed a restroom had to use a neighboring building. The Seventy-Fifth Anniversary of the Temple was celebrated with a special service on October 20, 1957. Visiting Rabbis from St. Joseph and Kansas City officiated, and President Julius Meyerhardt gave a history of the congregation. Songs by John Rich and Bobbie Herman accompanied by local organist Carl Burkel rounded out the service. In 1968 the Temple underwent a renovation of the interior. Some of the walls were paneled with walnut paneling, and red carpeting was installed over the entire Temple floor. The old square ceilings were arched, new electrical fixtures installed and air conditioning was added. Stained glass windows depicting Jewish symbols were also added. A benefit showing of the movie, Thoroughly Modern Millie at the Capitol Theatre was used to raise funds towards the restoration. Temple Beth El was entered on the National Register of Historic Places in 1976, as part of the Missouri State Capitol Historic District. More recently Temple Beth El has hosted celebrations for the 100th and 125th Anniversaries. Numerous Bar and Bat Mitzvahs, baby namings, Eagle Scout ceremonies and even a few weddings have been held at the Temple through the years. The congregation currently includes about 25 families, and continues to hold Shabbat services each Friday night and also observes the major holidays. Family Tree Information about Temple Beth El Founders. This information contains sources. This article by Mark Gordon first appeared in American Jewish History in March 1986. It identifies synagogue buildings which existed before 1900. Temple Beth El is included in an E-Book written by Julian Preisler titled, “American Synagogues: A Photographic Journey”. The E-Book has over 3200 original color photographs of over 1400 US synagogue buildings from all 50 States and Washington, DC. This Plaque was placed in the sanctuary by the founding members in 1883. By untiring exertion and labor have secured and presented to this congregation a house and a lot, dedicated to the service of the most high. Therefore be it resolved That the Congregation Beth-El, do hereby express their most heartfelt thanks and invoke the blessing of the Omnipotent, to whose service, their zeal was directed, on each and every one of the above named Jewish Women, of whom our nation may be proud. Resolved That a copy of same signed by all Charter Members, be presented to the Hebrew Ladies Sewing Society, and another copy be framed and hung in the Temple for which they so earnestly worked. The names of the founding members of Temple Beth El are listed below. We are currently doing research to find out the descendants of these families. Click on the names below to find out more about our founders. If you have any knowledge of these men and women or their families please click here and send and e-mail. We would welcome information to add to our historical files.